Please download and see the agenda. This page contains hopefully useful travel and accommodation information about Malta for participants of the LCT Annual Meeting 2017. Not all sections are complete but the page is live and will continue to be updated. This document is for information only and does not constitute an invitation. For clarification please contact Ivana or Bobbye. YOU ARE ADVISED TO BOOK ACCOMMODATION EARLY (i.e. NOW) using reserved accommodation or standard booking engines. Airmalta: direct connections to Frankfurt, Munich, Milan, Rome, many major EU cities. Ryanair: cheap connections to France (Marseilles), Italy (Bari, Milan (Bergamo), Trapani, Pisa, Bologna, Venice (Treviso), Rome (Ciampino)), Spain, UK (London Luton; Scotland), Ireland (Dublin); Berlin. City buses are fairly cheap (€1.50 for 2 hrs with change of bus). There are many buses from airport to different parts of town. You’ll make it but it’s a hassle. You can get a 7-day bus card at the airport (arrival hall) for €21. The card is valid for unlimited bus travel, including night buses and buses in Gozo. Bus info is at https://www.publictransport.com.mt/ but the site is not great. Google Maps also works for buses. Don’t forget that Malta uses UK-style square pin plugs, standard voltage (220-240v). Please bring an adaptor for your electrical appliances. Check ambient temperatures. Swimming may be possible! Buses arrive close to the Triton Fountain. Follow dotted route above to Valletta Campus. A special rate of 60 euros/night including breakfast at this hotel has been negotiated. The main advantages are (i) tranquillity (University is 5 mins walk across a pleasant valley) (ii) relatively cheap rates. The disadvantages are that it is in a residential area, not that close (ie 15mins walk) to bars and restaurants. Shared accommodation, located close to University campus in Msida. 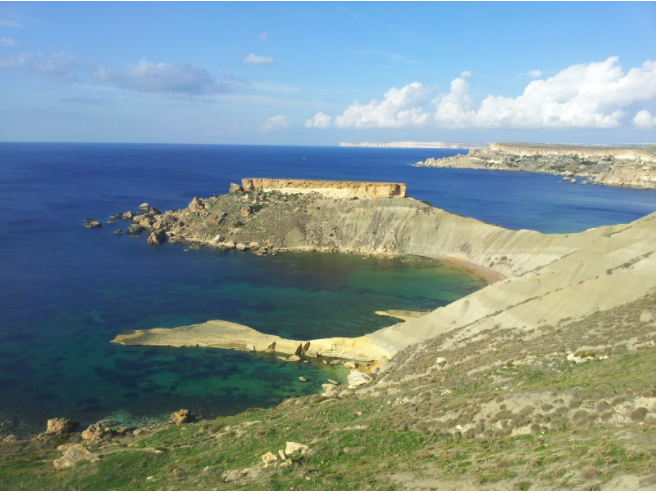 Also close to various cheap bars and eating places in Msida [map]. Bus Airport to NSTS: Bus X1 will take you to University 1 stop. Then walk about 10 mins (see map). Alternatively any bus to Valletta main bus station, then catch bus to Qroqq stop also known as "skatepark roundabout". It’s a short walk to residence. Transport NSTS to Valletta: walk to skatepark roundabout Buses 21, 13, 14, 15, 16 all arrive in the area of the Triton Fountain. Important: extending your stay. The NSTS admin is aware of all those who registered for accommodation using our registration form. The standard 3 -night stay 23-26th May is paid by LCT. You can stay longer provided that (i) you pay the extra days and (ii) you advise the NSTS admin by email and (iii) NSTS confirms. To avoid confusion please communicate with NSTS as follows ensuring that they know that you are from the LCT group through the subject field. The message should clearly state your requirements. There are plenty of other hotels available on the open market in Sliema or Valletta (use booking.com or airbnb). 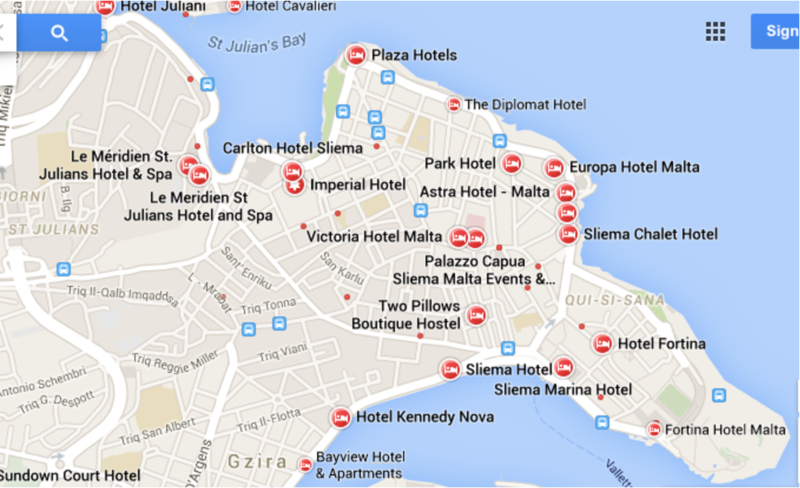 Sliema: Wide range of accommodation/prices/quality. Good bus connections from Sliema to Valletta. Many bars and restaurants. Valletta: Walking distance to the meeting venue. Expensive these days due to EU Presidency. Campus is about 25mins walk from campus (see walking map). There are also buses which go along the promenade and arrive at the “Universita’” bus stop. Approx 20 mins + waiting time. Bus ticket bought on bus costs 1.50 for 2 hrs. Most hotels around the seafront promenade are OK and there are frequent bus connections to Valletta. The accommodation in the map above and those listed below is a just selection. All and more can be found at http://www.booking.com and some have their own websites. 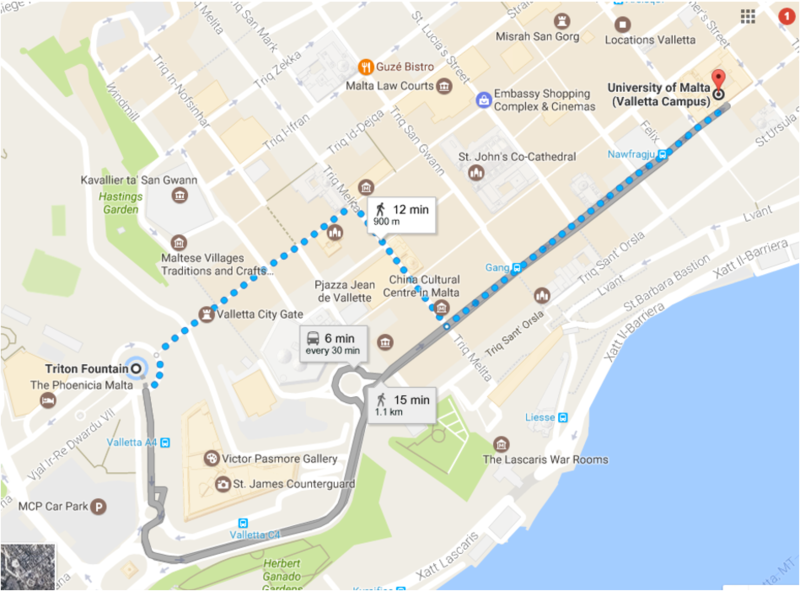 You can get to University on foot (30 mins) or by buses 202 or 203 which pass along the northern promenade, passing Sliema Ferries area. These run every 30 mins. Preluna Hotel *** (83) Icon 1960s architecture. Great sea views from upper floors. Depiro Point: 2 bedrooms (€90/night); and 1 bedroom (€60/night) apartments available. Pebbles Apartment Hotel (€65/night) for double studio w sea view. It’s also possible to stay in Valletta - main advantage is that it is a unique miniature capital city with many architectural and cultural attractions. Also try googling “Valletta boutique hotels” for something unusual. Excelsior ***** Great views -- standard price is 225 but deals are possible if you book early. Phoenicia ***** Old fashioned. Pleasant private gardens. Prices from euro 240/night. Osborne *** Well positioned 7 mins walking distance. euro 110/night. Castille *** Similar to Osborne - building is quainter and good views from rooftop restaurant.c. euro 125/night. British ** Wonderful harbour views. Character but a little tired. 9 mins. 85-120/night. Grand Harbour ** Similar to British. For both move fast to get a room here. 140/night. These places are rough and ready. Try to phone up or contact beforehand to check exactly what you are getting. Malta prefix is +356. Midland Guest House, 255 St Ursula Street, Valletta – Tel: 21236024 (10 bedrooms). Asti Guesthouse, 18 St Ursula Street, Valletta – Tel 21239506, (8 bedrooms). Valletta Town House. (99-135/night). Recommended by 'The Guardian'. Valletta G-House. Merisi Apartments: google Merisi Valletta.